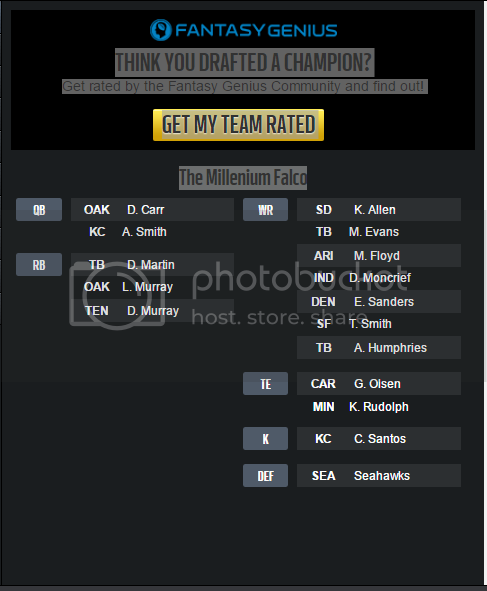 12 team Auction draft, standard scoring. Overpaid for Bell, but I think I can manage during his suspension and he's my #1 RB once he gets back. Prefer Auction leagues since you can pretty much get the guys you want to get and not worry about draft position. Also like the strategy of it, and nominating the guys you think are overrated. Missed out on Sims who was bucs target I wanted and think could be huge if Martin gets hurt or has an off year. Kind of half-assed the draft cuz I was watching the Jays at the same time and it cost me a couple times. Rocker what is your league, 6 people? Yeah. The manager royally screwed up the invite process and a few people dropped out. The league I manage is 12 man, we draft in two weeks. Ebron could be a steal. Thought he was done for the year. 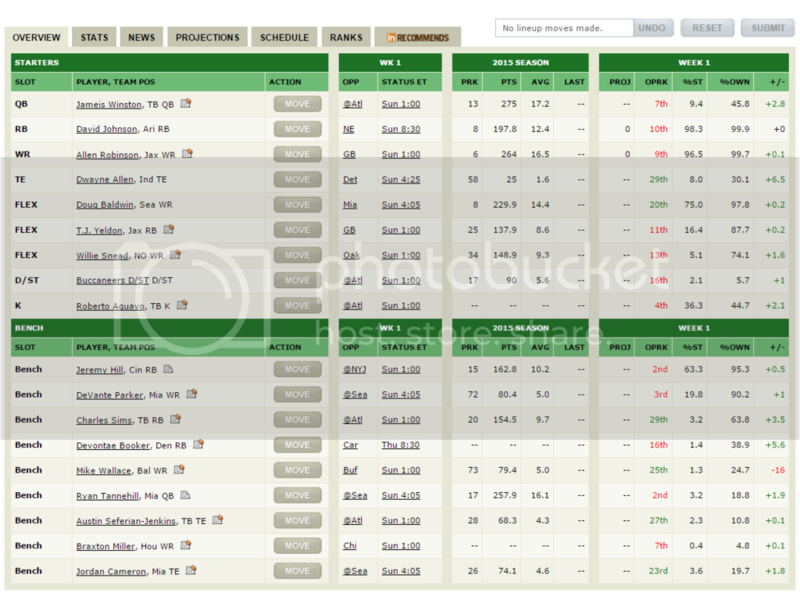 12 man ESPN league, .5 PPR (10th pick) - Had to have the wife take over in Rd 12 to take thing1 to appt. My league, 8(9?) years running. I had the 12th pick. Kept Martin. I hate your RBs. Sorry Rocker. Doctor wrote: I hate your RBs. Sorry Rocker. Fair enough. I'm not super excited, but I think the platoon equals out to a respectable RB1/RB2 combination. This is the result of drafting last in a keeper league. Thomas has been a beast in TC. I love Carr, great value. What round 7? Peterson is as safe as it gets. Don't really like Langford. Ivory was a great pick up, I just missed out on him in mine. First team looks good, Corsair. Depth at WR may become an issue. Doctor wrote: Thomas has been a beast in TC. I love Carr, great value. What round 7? Peterson is as safe as it gets. Don't really like Langford. Ivory was a great pick up, I just missed out on him in mine. I got Carr in the 11th. Stay away from QB's, you can get value way down the board. Tannehill in the 14th. Langford is a 3 down workhorse. I have doubts that they will be playing with the lead much, but he still figures into a solid starter and if he shows any flash at all he's hitting 100 and a TD frequently. My only regret is that I didn't get McKinnon as insurance. Hoping he gets dropped in the first few weeks while AP looks like his old self and I can catch him on waivers. By that time Coleman, Henry, and Wheaton will have shown their true colors. I think Coleman can be huge for RGIII, but I question their offense. Derrick Henry will either take touches away from Murray, or I keep him in case of an injury (not a fan of that option), and Wheaton will either benefit from Martavis and Green not playing... or Sammie will take over. Last edited by Corsair on Tue Aug 30, 2016 2:07 am, edited 1 time in total. And Doug fell to me in the third. Mike Evans fell to me at pick 48. No one was touching him or Martin in my league. Don't worry about McKinnon. Handcuffs are overrated. I've often found that my RB3 ends up being a better start for an injured RB1 than his handcuff. In your case Ivory >> McKinnon. And you can always use your RB3 in a flex or as a bye week replacement while your handcuff collects dust. Handcuffs are only really worth it if they are pretty on par with their starter, say Sims and Martin or Yeldon and Ivory. When it's a huge gap, it's not worth it and sometimes even a complete waste. Sure, McKinnon could be the back up now, but maybe Asiata gets a hot hand and they go with him all year. Ask all those who had Kniles Davis when Charles went down and they went with Ware or West. I'd also much rather bet on say Henry being a sleeper and overtaking Murray than having a handcuff like McKinnon. Just my two cents. I like this team a lot. It's an IDP league but I won't get into those. I went WR Rounds 1-3, 6, and 8. I took Larry Fitzgerald in Round 8 when I only had 1 QB and 1 RB. The Bridgewater injury really hurts since QB was already my weakest position. Best case scenario my WRs get hot, give me huge weeks and carry my team. I'd play Bradford over Bridgewater anyway. Bridgewater is not a fantasy QB at all. Right? Bridgewater went undrafted in my other FF league. Not even picked as a 2nd. It's a 12 team, 2 QB league so every starting QB is owned. Even Goff and Romo are owned at this point. My only options right now for a backup are Keenum, Wentz, Paxton Lynch and Shaun Hill. I've added Lynch just to see how this final preseason game goes. I figure with his weapons he could be the best if he ends up starting down the road.